What are you going to do if an employee reports you or when an OSHA inspector shows up at your business looking for safety infractions? Until they read your safety plan! In the time it takes for an OSHA inspector to walk in your front door for a “courtesy visit” — actually looking for your company’s safety plan, you can have it printing before s/he fines you upwards of $7,000 for not having one! It may seem the “clear and present danger” is OSHA, but it really is necessary to create and maintain a safe and healthy work environment. By protecting your people, you protect valuable company assets, as well as prevent production downtime and the costs of lost-time hours. Here’s what you and your people need to know and do — All in a nice handbook. And it will keep OSHA out of your pocket! The risk of getting a visit from OSHA is more likely than ever with increased enforcement actions. This informative software system will prepare you and your managers for an OSHA inspection, minimizing legal risks, headaches and, of course, injuries. Over the last year OSHA has been rolling out several rule changes to update and tighten policies, showing its commitment to a more aggressive enforcement agenda. Don’t get caught unprepared, use Safety Plan Builder Illness & Injury prevention plan software to prepare your workplace for an OSHA Inspection. Writes an OSHA-compliant safety plan and training handbook fast! gives your business a BIG business advantages! (California SB-198 too), avoid lawsuits, train your employees, and provide a safe workplace. 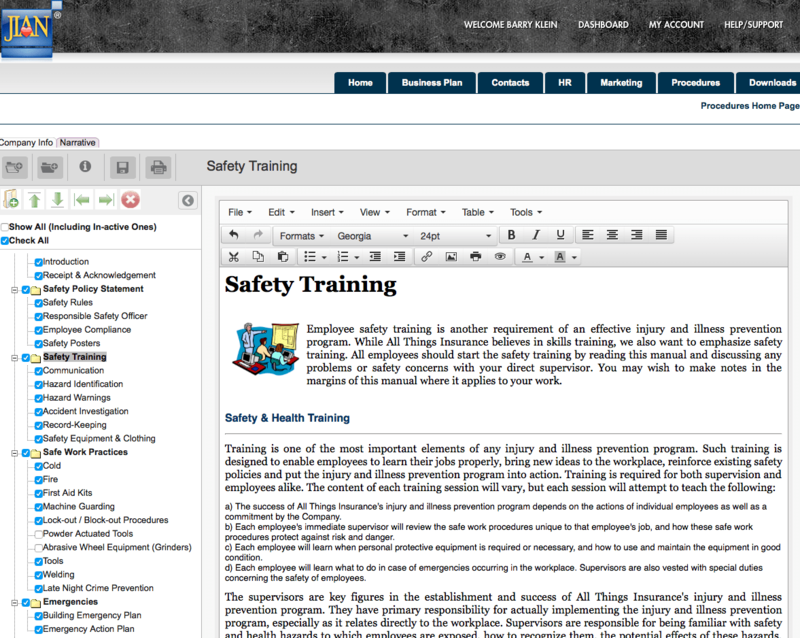 If you haven’t created your company’s safety program or you have been tasked with writing a safety plant, Safety Plan Builder is the place to start. Menu-driven from start to finish, its organized system gives you a comprehensive Injury & Illness Prevention Plan manual that has been thoroughly proven. There are no new programs to learn — just click and edit! Talk to your insurance agent! You may be able to save up to 15% on workers comp insurance! The federal Occupational Safety and Health Act (OSHA) sets a national minimum standard for safety, but allows local jurisdictions to adopt standards which are at least as stringent. Under common law, as an employer, you are obligated to provide your employees with a safe place to work. As a business person, you must provide customers, vendors and other people who visit your company site with safe passage. As an owner or occupant of any property, you must maintain it in a condition safe for everyone who comes onto your property. A simple lock-out block-out device could have saved the lives of two men who were cleaning a tire manufacturing machine at the Bridgestone Tire & Rubber Company in Akron, Ohio. The lock-out is placed on the On/Off switch to prevent anyone from accidentally starting the machine. The block-out device is like a steel bar wedged in the gears that prevents the machine from moving. Apparently the men used neither device and were unaware of the hazard. The director of OSHA personally delivered a $7.4 million penalty against Bridgestone! A $150 investment in SafetyPlanBuilder and a few minutes’ work to create a written company safety manual might have prevented this tragic accident and saved Bridgestone millions! It can for you. Comply with OSHA workplace regulations with ease! Introductory memo (can easily be copied into an email) to employees. — a plaintiff’s lawyer will have a difficult time bypassing this document! It’s a tangled mess of complicated laws, but Safety Plan Builder sorts it all out for you. When laws differ, Safety Plan Builder takes the highest legal standard and builds it into your plan — to offer you and your employees maximum protection. The result? Don’t think you’re safe if your business is office-based rather than industrial. You’re still required to comply with OSHA, and you’re still vulnerable to lawsuits! A written safety manual is important. In addition to the legal protection Safety Plan Builder provides, concrete benefits on a basic human level. A written safety plan can boost morale, preserve the health and productivity of your employees, and help create a positive atmosphere in your workplace. With Safety Plan Builder, everybody wins. Menu-driven from start to finish, Safety Plan Builder’s organized system gives you a comprehensive Injury & Illness Prevention manual that has been thoroughly proven. No new programs to learn! Just click and customize. If publishing a safety plan is on your to-do list, you can get it done and in place quickly. Time it… about 20 minutes from start to finish! Pull-down from the NAICS listing to auto-fill your industry throughout. Cloud-Based App & Templates — Works for BOTH PCs & Macs! initial subscription for just $1 / mo each! Enhanced 128-bit Cyber Security — You control access, user by user! HR and Management Policies and Procedures Subscription Package! So you can grow your business without drama! Everything you need to manage HR for your company is right here. 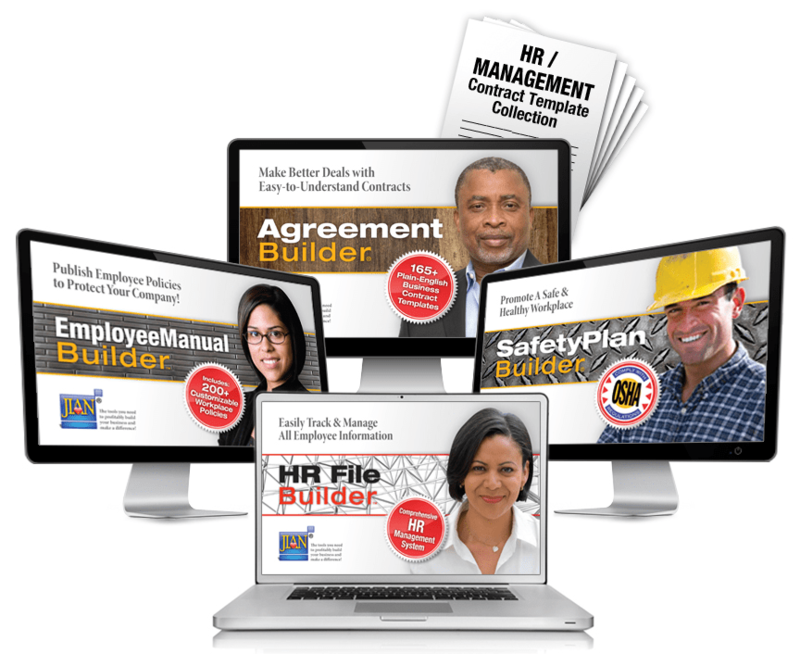 When you subscribe to this Human Resource management platform, you’ll create or upgrade your entire HR department overnight!